When two moles of aldehyde is treated with sodium hydroxide, a reaction occurs in which one mole of aldehyde is oxidized (giving carboxylic acid) while the other mole of aldehyde is reduced (giving primary alcohol). 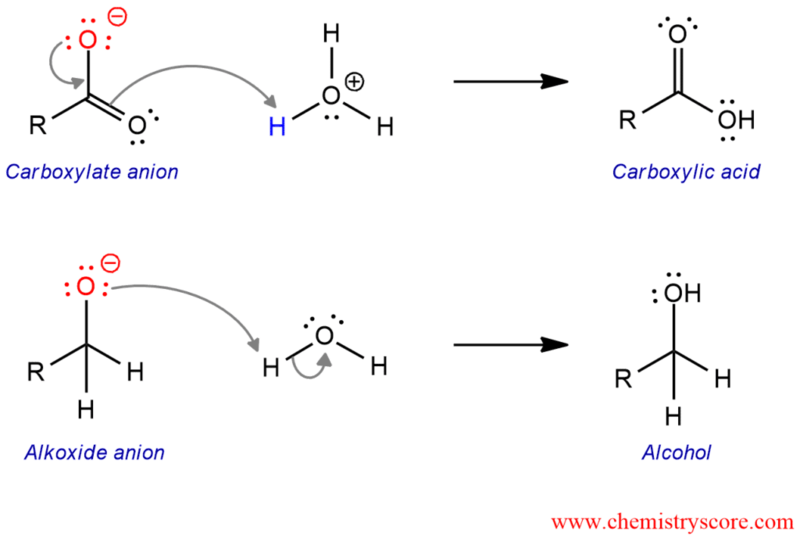 Cannizzaro reaction is disproportionation reaction in which two molecules of an aldehyde are reacted to produce a primary alcohol and a carboxylic acid using a hydroxide base. This is shown in the example of benzaldehyde which produces benzoic acid and benzyl alcohol. And disproportionation is a redox reaction in which a compound of intermediate oxidation state converts to two different compounds, one of higher and one of lower oxidation state. In the first step, a hydroxide ion serves as a nucleophile to attack the carbonyl group of aldehyde. This is followed by deprotonation to give a dianion. In the second step, the resulting intermediate then functions as a hydride reducing agent. This unstable intermediate releases a hydride anion which attacks another molecule of aldehyde. In this process, the dianion is converted to carboxylate anion and the aldehyde to an alkoxide anion. And in the last step, the alkoxide picks up a proton from water to provide the alcohol final product. The alkoxide is more basic than water so this reaction can proceed. And the carboxylate anion is converted to the carboxylic acid product after acid workup. Because the carboxylate is less basic than water, thus cannot pick up a proton from water and requires an acid workup to protonate. More useful is the crossed-Cannizzaro reaction in which two different aldehydes react. Usually, formaldehyde is reacted with another aldehyde. The formaldehyde reduces the aldehyde to alcohol and is itself oxidized to formic acid.